Though it�s been completely renovated and refurbished since its establishment in 1826 the Yar restaurant still holds a decidedly turn of the twentieth century veneer. The restaurants extensive and colourful history is preserved in the numerous paintings, pre-revolutionary photographs and moldings, on the near-century old marblite walls, still standing as they were when Rasputin and Tolstoy themselves dined here. 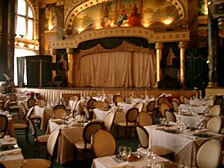 Now housed within the impressive Sovietsky hotel the restaurant is a testament to all things elegant. The kitchen has been brought up to date in a big way, offering modern haute cuisine like Russian caviar collections, Foie Gras on an apple pillow, garnished with glazed rhubarb and �Kvass� bread or Smoked tender duckling breast with mango and marinated strawberry salsa. A perfect blend of old school refinement and modern day Michelin starred gastronomy.